Premier Bank Jobs Circular 2019. Premier Bank Trainee Probationary Officer, Junior Officer Job Circular. Premier Bank is the Privet commercial bank of Bangladesh. Recently Premier bank has been announcing many jobs circular for his bank. So we are given all the information for this bank. If you want to build your career Premier Bank Trainee Junior Officer job circular 2019 you can change this circular. Recently premier bank Trainee junior Officer, Trainee junior Officer (CASH) post has been published this requirement for this bank. You can also JBC Jobs Circular here. Premier Bank is the most favorite privet commercial bank of Bangladesh. Now, this Bank gave some suitable position requirement notice for you. 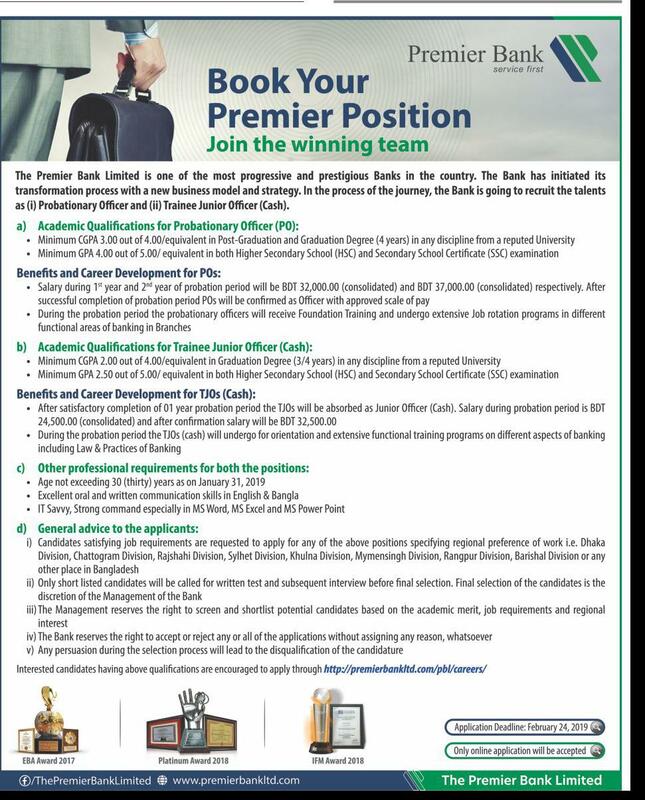 So if you want to build your career premier bank job circular 2019 this is a suitable position for you. MBA/MBM/BBA/Masters /04 years Honors Degree in Accounting, Finance, and Finance and Banking, Marketing, Management, HRM, Mathematics, English, Economics, Statistics, International Relations, Public Administration and Computer Science with at least 02 1st class/division/equivalent. No 3rd Class division equivalent CGPA in academic records is allowed. Age Limited: Not over 30 years as of 2019. If you want interested Premier Bank Trainee Officer Job Circular 2019 you can apply our website. We are given a link for this bank jobs apply link you can apply here Trainee junior officer, Trainee junior officer cash without any fee. When you compiled your application you can take you to admit some few days let. We have given here how to download your admit for these jobs. When will be published this admit can be download here. After download you can get your Exam Date and also get where you have given this exam we are giving this information for this circular. After Exam, you waiting for your jobs result if you want to give this result without any problem you can visit our website we are given first when will be published this jobs circular result. Premier Bank Jobs Circular 2019 Result will be published by this page. After completing this exam will be published this job exam result. When will be published Premier Bank Jobs result 2019 same time we will be published here. You also have given all the information our Facebook fan page for any jobs circular result and more educational information for your life.